I'm sure this is a great book, but frankly, I didn't like it much. Like a bad wax museum, the book poses life-like figures in attitudes of historical verisimilitude but utterly fails to give the scene life. I struggled to get through this book. It was literally work. Jacob de Zoet is a young clerk newly arrived in Japan in 1799, with plans to work for six years to earn enough to marry the girl back home in the Netherlands. At this time, Japan remains closed to the Western world. Somehow, the Dutch East India Company has managed to arrange a single trading port outside Nagasaki--the artificial island of Dejima. Roughly the first third of the book sets up the characters and protocols of Dejima: the company directors, the clerks, the slaves and servants, the interpreters, the Japanese magistrates and functionaries, the hangers-on. Technically, only Dutch are allowed on Dejima, but the Company takes anybody it can get, and the Japanese can't really tell Irish from Prussians from Dutch. All the Europeans are crude, obnoxious, corrupt and angling to maximize their profit from the Company by whatever means they can find. Poor Jacob de Zoet is hired to reconcile the accounts and root out the rampant embezzlement, which means everybody hates him and he is totally going to get set up to take a fall. So, the score thus far: Decency--1; Manipulation and Venality--Everybody else. There is probably a lot of meaning and nuance in this section, but frankly, I couldn't tell most of the characters apart from each other, and their shifting alliances and crude self interest meant that I never cared to make much of an effort. Lots of bad people, trying to outmaneuver the Japanese who don't like them anyway. And the Japanese are racist and controlling and equally corrupt. The sheer amount of payola that passes in each transaction--plus the all the fictional accounting entries--it's no wonder the Dutch East India Company goes bankrupt. So, there's really nobody to root for on either side of the Dejima trades. Jacob de Zoet is criminally naive, and so he stands out from everybody else who is trying to use him to advance their own financial crimes. There is the Japanese midwife, Aibagawa Orito, who is at least doing something other than trying to make a fortune in trade. So of course Jacob falls in love with her, and spends a great deal of (boring) time wrestling with the (boring) complications of cross cultural infatuation. There is also an orangutan named William Pitt. Don't ask. The middle section of the book takes an abrupt turn from turgid discussions about freight costs and interest on loans, and becomes schlock melodrama. Or speculative fiction, if you are being charitable. Poor little Aibagawa Orito. she has a burn on the side of her face after a childhood accident, and is officially considered unmarriageable. Even so, Jacob wants to "marry" her, in the traditional way of Europeans taking "Dejima brides" and then abandoning them when they return to Europe. Jacob is too conflicted or naive oridealistic or racist or shy or something, so he never asks. Anyway, her family was too high status and wouldn't have allowed it. There is also a young (Japanese) interpreter wants to marry her, but his family forbids it. When Orito's father dies, it turns out that he was in significant debt to the Abbot Enomoto, and so Orito is sold to his monastery and spirited away to a mountain shrine which has a Terrible Secret! Mitchell tries to heighten the mystery of the Terrible Secret by dribbling out the facts, but they are pretty easy to guess. Fifty monks and twelve nuns live in the compound. Two of the sisters are "chosen" each month for "engifting," meaning five to ten different monks come over five nights and try to impregnate them. The subsequent infants are taken away, ostensibly to be given to foster families. Instead, they are killed to allow the monks to drink their essence and live forever. There is much Maguffin-ing around the fact that the sisters serve for 20 years, and then are allowed to descend the mountain and live with their children. The graveyard of unmarked stones just downhill is not really a surprise, is it? Also, there is some monk whose job it is to write annual letters that purport to be from the babies as they grow. Orito discovers all this during her escape attempt, conveniently stumbling on the forged letters and then overhearing a particularly damning conversation, and then discovering the Top Secret Shrine of Death as well! Plus, she escapes the monastery, but then voluntarily returns because (what a coincidence!) also that night her friend goes into labor with twins--a certain death sentence without a trained midwife. Really, it's kind of a creepy Japanese Death Cult/Vampire story crossed with a Bruce Willis movie, and a far cry from the stultifying financial plot of the first third of the book. Which is not to say that this section does not itself suffer from being over-written. Orito's escape laboriously winds through nearly every room of the entire monastic compound before she gets over the wall. Simultaneously, the poor rejected interpreter/suitor from the first third of the book is informed of the abominations at the monastery, so he too mounts a rescue mission with his old martial arts master and 10 masterless samurai. 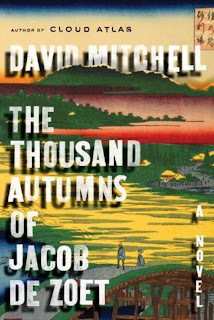 This gives Mitchell a chance to be boring about each of the different bridges between Nagasaki and the mountain, to detail each minute alteration to the flora and fauna of the terrain, and generally make a midnight ninja raid on a Temple of Doom into a boring lecture on natural sciences. As a sign of Mitchell's resolute insistence on making everything tedious and unexciting--just before he enters the temple to rescue the fair maiden and claim her as his bride, the poor schmuck takes a drink that turns out to be drugged, and he wakes up to find all his samurai and his old dojo master were in the Abbot's pay all along. So there was not actually any rescue mission, there was no fight, there was no triumphal entry. . .just a drowsy little man who gets killed for his pains, and even that scene takes place off stage. So, two thirds of the way through the book we have--venal back-stabbing and gossip on Dejima, leading to nobody actually making any money or getting off the island. We have Japanese Creepy Secrets which are all related second hand. We have an action sequence that isn't. If the vulgar inhabitants of Dejima were to review this book, they'd assume that the author had difficulty sustaining his manhood--all build up, no climax. De Zoet is still toiling away in unappreciated honesty in lonely Dejima. Orito is still stuck up on the mountain. The interpreter is dead. So what the book clearly needs now is a gouty British ship's captain with delusions of forcing open Japan to British trade. Done! All of De Zoet's financial hygiene has resulted in only one person getting caught and removed from Dejima--a foul insect named Snitker. Snitker has managed to worm his way into the notice of this delusional British captain, and convinced him to sail (with only one small ship) to Dejima. By flying a Dutch flag, he can take advantage of the fact that Dejima doesn't know that the Dutch East India Company has dissolved into bankruptcy. The ship can enter the harbor, commandeer the shipload of copper that is bound to be anchored there, and declare Japan for England. There is much tedium about the causes and effects and treatment of gout in 1800, the specifics of which sails get raised and lowered in which order, and other boring details of ship's life. Nobody on board the ship is particularly likable either--they are all gunning for glory or riches in one form or another, and are basically as unlikeable and venal as the Dutch and Japanese we have met so far, but with fewer syllables to their names. Seriously, that's about the only difference. But once the ship gets to Dejima, there is no copper to commandeer. The negotiations with the Japanese have broken down, and the Company never sent a ship to carry it anyway. So there is a desultory bombardment of Dejima, and some bad feeling between Snitker and all the rest of Dejima, and then the British go away and Jacob De Zoet ends up in charge of the port. Again--lots of build up, but no pay-off. Except! The magistrate of Nagasaki has been humiliated by the British encroachment and prepares for is ritual suicide. He asks the Abbot Enomoto to assist him, then cleverly poisons himself, his chamberlain, the Abbot and the Abbot's acolyte as his judgment on the Abominations at the Temple of Doom! And they all slump to the floor while monologuing about the justice of their positions! And thus the temple will be brought down! And the women freed! And immortality no longer bought at the price of murdered babies! Then we get some epilogues. 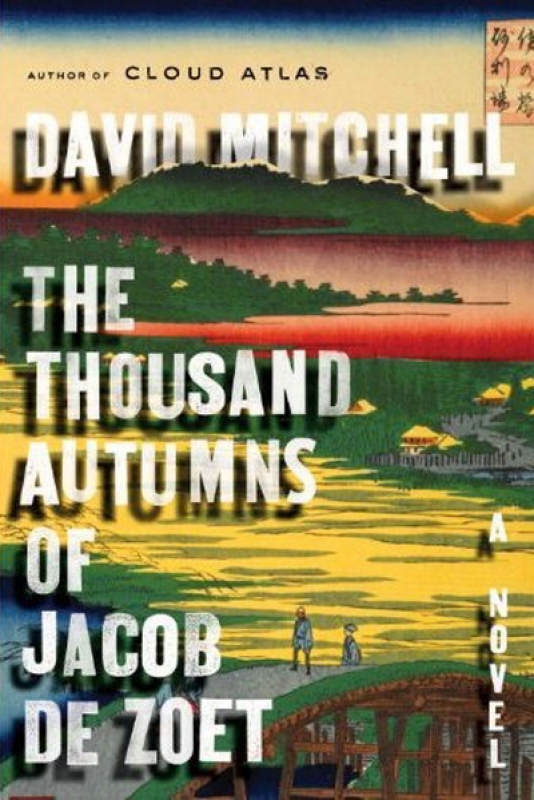 Jacob spends another eleven years as the head of Dejima, but since there is no trade, it's not clear what he does other than father a son and eventually meet Orito again and apologize. Eventually he gets banished from Dejima and he goes back to the Netherlands, marries some nice girl and dies an old man the end. To be fair to Mitchell (and I loved Cloud Atlas, so I want to find merit in this book) there are some potentially nifty metaphors that are played out in parallel. Orito is isolated in her monastery just as Jacob is isolated on Dejima. The secrets of the monastery are eventually made public, just as Japan has to be opened to the rest of the world. Enomoto might be 600 years old, but the cost of keeping him alive is not worth it--just as the culture of Japan cannot be preserved because the costs of that preservation are not sustainable. It's a novel of ideas, perhaps, and an impressive recreation of a time and place that are not well known. It was carefully observed and the writing was well-crafted. It was just so much work to get through this book, and I didn't enjoy it, and even in retrospect I can't endorse it. The pain-to-pleasure ratio is way out of whack. If you want to know about the history of Japan from 1799-1800, get a history book. If you are looking for a ripping good read, get Mitchell's book Cloud Atlas instead. So why has it been so hard for me to find someone is not enthralled with this book? I read 1/8 and so far I am disappointed with the actual writing. The story is all I see. Literature should be more, shouldn't it? So why do 9/10 or maybe 99/100 reviews offer so much praise? I am reading it as part of a book club but after Sister Carrie (Dreiser) and now, this, I'm considering quitting.